There are some make-at-home recipes that are simply not worth the effort. Sure, you can take a certain amount of pride in the DIYness of it all, but is it really that much better than the storebought version? When we started the butternut squash turnovers for our Fakesgiving dinner, I was afraid we’d stumbled onto another of this ilk. Frankly, the jury was out until we had our first bite of these bad boys right out of the oven. 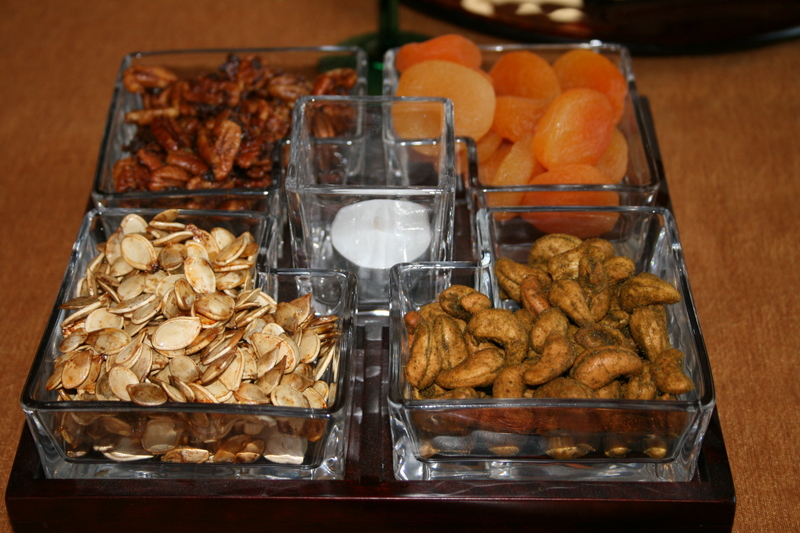 For our early Fakesgiving dinner courses, Mike and I set out a cheese tray from Cheesetique with a variety of spiced nuts, dried apricots and toasted pumpkin seeds (right). We wanted to add something autumnal and warm as a passed hors d’oeuvres and came across this recipe in October’s Food and Wine magazine. 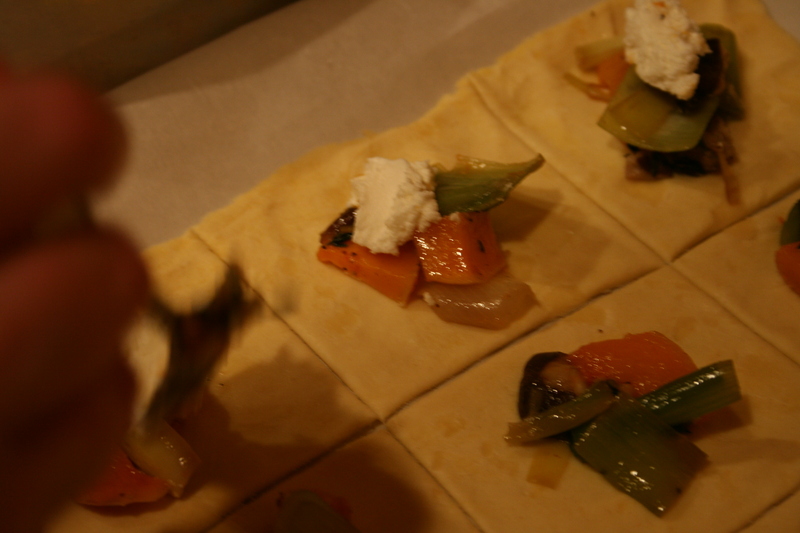 It combined some of our favorite fall ingredients: leeks, squash, mushrooms, thyme, and fresh goat cheese. How could we go wrong? First of all, if you’ve ever peeled a butternut squash you know what I was in for when I began prepping this recipe. The awkard, semi-phallic squash is a mighty departure from the linear, glide your peeler right over it carrot. It is bulky. It is slippery. It is a treacherous beast to dice if you value your fingertips (and I do, unlike Mike who sacrificed his pinky in a pumpkin carving incident the night before. He is SUCH a knife fighter). Luckily step two presented significantly less hazard: saute leeks, mushrooms, garlic, and thyme in olive oil. The smell of this filled our apartment and immediately made me forget about hassle factor of the squash. 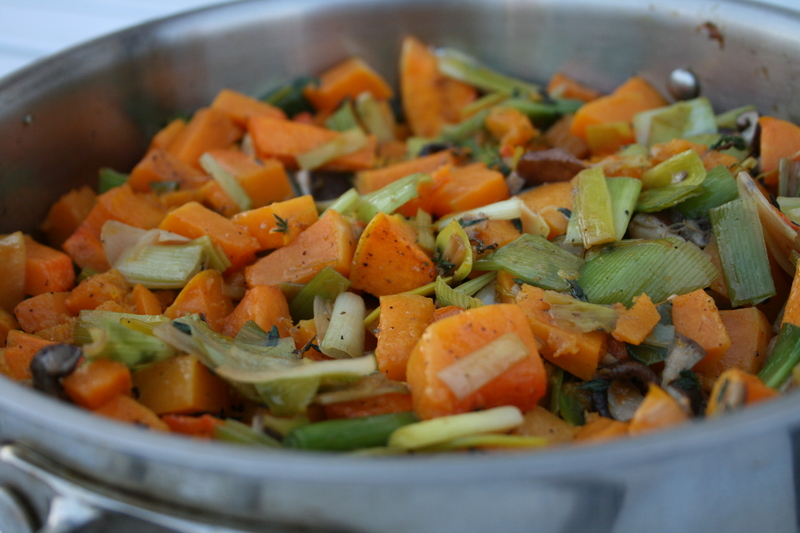 Once the squash was done baking, I tossed it into the pan with the other ingredients. Okay, this was all coming together. I covered this concoction and set it aside to prep some other recipes and battle with the dust bunnies so our friends didn’t think we were total slobs. Final results and the full recipe after the jump. After wrapping up other chores, I put my focus back on the turnovers, which we hoped we could pull right out of the oven as our friends arrived. I laid out the (store bought) puff pastry on our floured counter and cut it into squares with a pizza cutter. I spooned the squash-vegetable mixture into the center of each square and added a dollop of fresh goat cheese (from Bowers Fancy Dairy Products at Eastern Market) at a 2:1 ratio. I then began, ever so kindly, to fold the corners of the pastry dough to the top to wrap the turnovers snugly into their new homes. The pastry dough was not having it. “Submit! You will submit!” Okay, I love to bake and I’m not usually in the habit of screaming at dough. But it had been a long day, featuring five fire trucks called on account of our smoking turkey and a trip to the ER for Mike’s slashed pinky before we even got started on food prep. Our friends were scheduled to arrive within 30 minutes, this was the last item on my to-do list before I could sit down with wine and I Would. Not. Surrender. The dough finally obeyed and I negotiated most of the turnovrs into a neat little wonton-like shape that contained their delicious, hard-won ingredients. Into the oven they went for 25 minutes and they came out golden, buttery and only slightly oozing goat cheese (which, really, is pretty appetizing). Mike and I bit into one. The result? Freaking amazing. If there is another dish out there that tastes like autumn in one single bite, I haven’t met it. The goat cheese combined with the butteriness of the pastry and woodsy depth of mushrooms and vegetables recalls parks full of crunchy leaves, wearing a jacket for the first bite in the air and brand new school pencils. 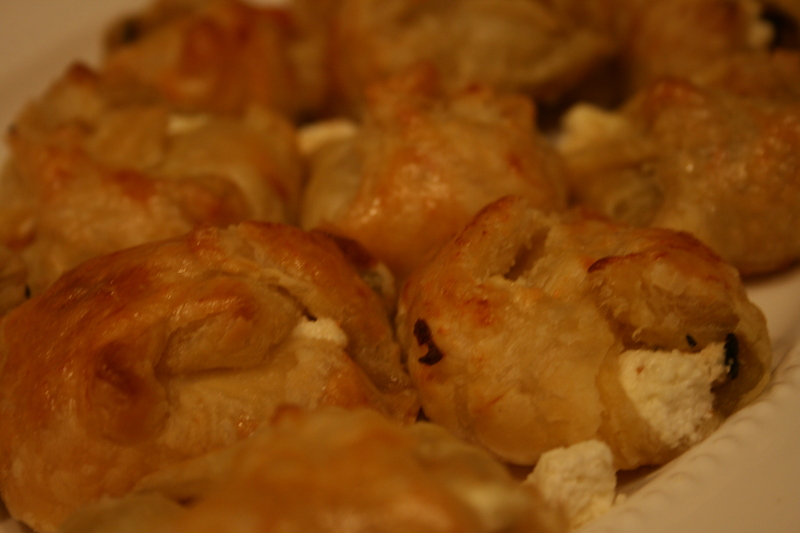 I will absolutely make these turnovers again although probably not if I am hosting a full blown, multi-course meal. Butternut Squash Turnovers, from Food and Wine magazine’s October issue. Wow, this looks AMAZING. Goat cheese and butternut are two of my most favorite things. I recognize that hors d’ouevres tray . . . By the by, I made a bacon, apple and sage stuffing for my office Fakesgiving today from a back issue of Cooks Illustrated. Those guys get it right every single time! Yes, that is our favorite tray. Nell, that stuffing sounds awesome. Maybe we can have a potluck Fakesmas in January? Lemmonex, I highly recommend the turnovers. Just take your time… and maybe have a couple glasses of wine during the process. Seems like something I’d like to try. Though I will buy the squash that is already peeled and chopped! Butternut squashes can be pesky to peel but if you pop the whole thing in the microwave for about 3 minutes before peeling and chopping, it makes the process infinitely easier. You will probably need to use a dishtowel to keep from burning your fingers but it saves you a bunch of time and effort! By the way, those turnovers were AMAZING. I made these for Thanksgiving and they were amazing. I barely ever cook and I was able to make these easily. Plus everyone raved, thanks! That’s awesome, I’m so glad it worked out! I had this at my sister-in-law’s three weeks ago and couldn’t stop thinking about it. Bought the ingrediants today and looked for the recipe on the web– your account was as tasty as the dish. Thanks for the wonderful compliment, Jana, and welcome to Capital Spice! We hope you come back often.